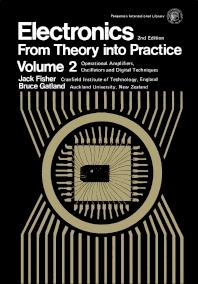 Electronics — From Theory into Practice, Second Edition, Volume 2: Operational Amplifiers, Oscillators and Digital Techniques is part of a series of publications that tackles concerns in integrating electronics theory with practical application. The text first covers negative feedback amplifiers, along with worked examples that show the application of ubiquitous operational amplifier. Next, the selection deals with power supplies, sinusoidal oscillators and waveform generators, and digital techniques. The last chapter tackles general electronic engineering practice, along with a survey of resistor and capacitor types, screening, earths and earth loops, and guidelines on the application of TTL devices. The book will be of great use to both professionals and students of electronics engineering.